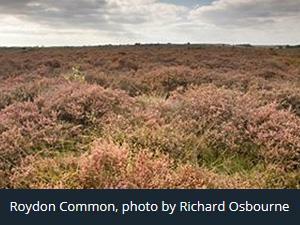 NWT Roydon Common01603 625540work Nature ReserveNWT Roydon Common is the largest remaining heath in West Norfolk. In the past, the eastern section was vulnerable to outbreaks of fire caused by sparks from passing steam trains before the railway running across the heath was dismantled. What to look for: Spring/summer cotton grass, cranberry, bog mrytle, cross-leaved heath, bog asphodel, all three species of British sundew, heather, sheep's sorrel, harebell. Black darter dragonfly. Autumn/winter hen harrier, merlin. Facilities: Information boards and way-marked trails. Directions: NWT Roydon Common is east of King's Lynn. Leave King's Lynn on the A149 to Fakenham and turn off at the Rising Lodge roundabout. Take the A148 to Fakenham for 300m and turn right towards Roydon. Two car parks are available on the right - 1km along, and 2.7km along. NWT Roydon Common is the largest remaining heath in West Norfolk. In the past, the eastern section was vulnerable to outbreaks of fire caused by sparks from passing steam trains before the railway running across the heath was dismantled.